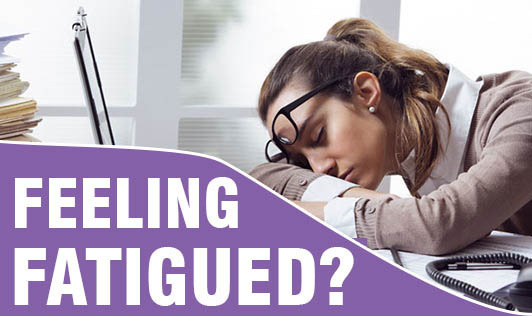 After long work hours, do you often feel fatigued? When you are fatigued, you cant concentrate and your productivity @ work goes down. Fatigue is different from drowsiness. In general, drowsiness is feeling the need to sleep, while fatigue is a lack of energy and motivation. Drowsiness and apathy (a feeling of indifference or not caring about what happens) can be symptoms that go along with fatigue. Research shows that getting adequate sleep helps promote a long, healthy life. Fatigue increases your risk for accidents, makes you more impatient and grumpy with your coworkers and family members, causes you to make mistakes you wouldn't normally make, and slows your reaction time. When you are tired, you don't enjoy life as much. How much sleep do you need? That all depends on your age and sleep needs - but most people do best with at least 7-8 hours a night. Some may need more. What's most important is getting a regular number of sleep hours each night (above 7 hours) to feel good, operate efficiently, and avoid diseases and accidents. Working extra hours or recovering from the flu might explain your fatigue. But if you are feeling really worn out and don't know why, it could be an indication of a medical problem. Fatigue that lasts more than a week and has no obvious explanation should be considered a serious symptom. So set up an appointment with your doctor. And don't hesitate to tell your doctor exactly what you're feeling. A walking program is an excellent way to build more energy - and improve sleep at the same time! Archives of Internal Medicine. Nov. 2008.